so you can draw two extra cards going to this story?? 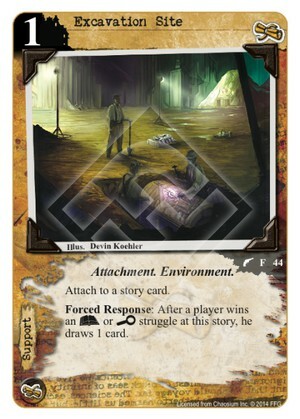 Obviously a downside with force response but I love me some card draw I'd try this out. With extra struggles from cards like Whitton Greene it could be more than 2 cards. yea but your MU you should be winning these most of the times, and have ways to remove the icons or struggles won't win. Danigral - 1 out of 5. Sure you can do a lot to almost guarantee that you’re drawing more cards, but you have to also figure out how to get through terror and combat. Plus as soon as you win the story, your draw engine is gone. Not to mention you are giving your opponent a chance to draw. There might be some interesting combos with ST to or certain conspiracies, but that may be stretching. mnBroncos - 3 out of 5. MU two best struggles, allowing them to draw two cards each time they go to this story seems so good. The only problem is finding deck space for this. Obtuse - 2 out of 5. Were you playing Miskatonic and feeling that if only you had a little more card draw your deck would be top tier? Oh, you weren’t feeling that? livingend - 1 out of 5. The symmetry of its Forced Response puts the caveat in Excaveation Site. Trading card draw with your opponent is generally a bad idea and playing this over one of MU’s other excellent options for card draw verges on insanity. Verdict: Nope, not diggin’ it. WWDrakey & Ire - 2 out of 5. With Combing the Archives or Open for Inspection this can be… hilarious. Still, a big risk card when facing off against Yog, another Miskatonic deck or anything resembling a Toga party. Additionally, Miskatonic has better ways of getting the same draw without risk of losing the advantage they usually get from being able to outdraw anybody. I think this card is meant to be paired with Explorers. I know the symmetry of the ability is generally unappealing, but remember that Cookie Fredericks wants your opponent to have more cards in hand than you. And if you have William Webb out, this story-based support card doesn't have to be temporary.